I heart letterpress. 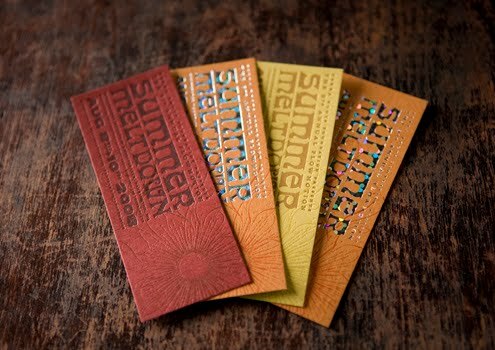 I love the raised surfaces that letterpress creates and the added hand touched quality that you don't always get with print. 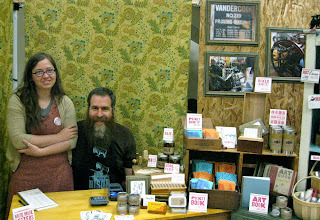 I met Carly and her husband, owners of Bison Bookbinding & Letterpress, at the Urban Craft Uprising show a few weekends ago in Seattle. They have a fantastic selection of hand bound notebooks and greeting cards. Some styles are available in their Etsy shop or you can find them at the Bellingham Farmers Market every Saturday. 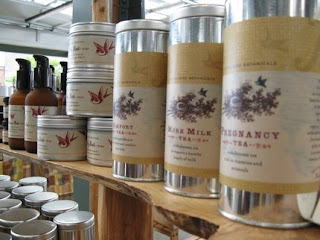 In addition to their products at the market (which included handmade awls! ), Bison Bookbinding & Letterpress are also available for custom projects and offer workshops and studio tours to help keep the tradition of letterpress and book arts alive in the community. The booth space was shared with a friend, Scout Urling from Flying Bird Botanicals who offers 100% hand crafted, vegetarian teas and bath and body products. You can check out their Etsy shop here. I'm not sure which booth it belonged to, but one of my favourite things there was the hand crafted jars of glue for sale. I just love (love!) their whole booth set up and how well it reflected the look of both companies and you know what I overheard while shopping? "I love seeing people smile when they look at our products". I was at the Bellingham Farmer's Market a couple of weeks ago and I totally missed this fabulous couple :( Now, I'll have to go back :)yay!